You are here: Home » MEDIA » Books » The Immortals Of Science Fiction by David Wingrove (book review). 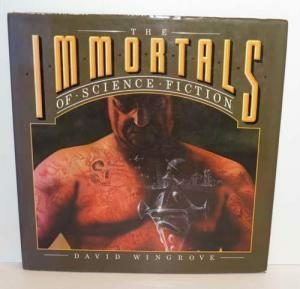 The Immortals Of Science Fiction by David Wingrove (book review). You might be forgiven for thinking that David Wingrove’s 1980 book, ‘The Immortals Of Science Fiction’ was about authors than their creations. To tell the truth, I wasn’t sure what to expect neither as I was investigating the art which has the vague ‘Young Artists’ to signify who they are that airbrushed the mostly double-page spreads. Quite why they don’t get a proper credit, even when looking up on google is a mystery. The blandness of the skin tone does tend to suggest that it’s all air-brush. Very popular in its days before digital could do most of the same tricks. What Wingrove has done is select ten characters from various books and posing as a time and inter-dimensional/reality traveller visit each of them to give a brief account of their lives and interview them. Well, all but one. Winston Smith in ‘1984’ wasn’t exactly available. Of them, I only recognised five of them without looking at the back of the book and only four in particular that I’ve read. It does raise an interesting question on how these characters were selected. Was it by permission or availability or both? Thinking back to that time, I would have thought there might have been better choices for some, even from these samr authors. Paul Atreides from Frank Herbert or Lazarius Long from Heinlein for instance. Certainly, Poul Anderson’s Nicholas van Rijn character should have been in the running up to that point. We can play mind games like this for a pastime. The art is interesting but not exactly inspirational although that depends on your personal taste and interpretation of what you think these characters look like back in the 1980s. If anything, the book is more of a curio these days. The real test will be whether or not if you buy this book will it inspire you to look at the source material. « Awesome science fiction and fantasy round-up (Offworld Report: Tuesday 7th March 2017).